We acknowledge and appreciate the work undertaken by your firm for motorized curtains, installation of 3D Silver Screen and furnishing of curtains/masking done at Manekshaw Auditorium Chandimandir in a utmost professional and time bound manners. Thank you so much. The principal of the college was ecstatic with the new motorized Curtains System. Everything was installed and working perfectly. First I want to say that the curtains look great! What a wonderful transformation from what we had before. Thank you so much for your help and technical support. 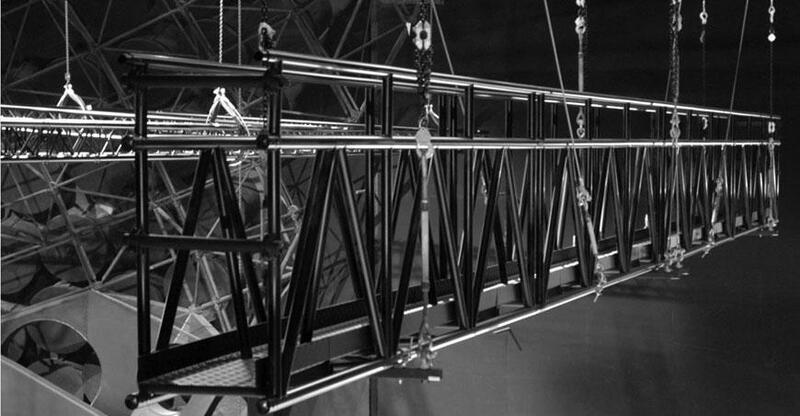 Stagecurtains.in offers a selection of high-quality catwalk systems. Whether you need these catwalks for an indoor production, an outside show, or any other purpose, you can rely on our equipment for each use. There is nothing more important to us than delivering safe and dependable products to our clients, which is why we make sure that all of our catwalks are compliant with safety standards. Catwalks are a complete system of footfall barriers and backstage floors. They are used for fall protection, inspection, maintenance and other minor exercises. We install Catwalk systems that are designed to accepted standards keeping employees safe and protected at each moment of working time. The construction allows two types of mechanism one is freely suspended and the other is self-supported. There is difference in tightness between hoists and spaces. The most common purpose of catwalks is to provide access to machinery and basic conveyors. They are also used to reach attics, clean rooms, overheads, racks, shelves, warehouses, etc. We ensure that the entire network is in excellent shape and work platforms are an easy access to employees. Elevated walkway, ladder, vertical, and angled platforms can be installed depending on the preference of the user and all of these are absolutely safe. Catwalk systems are an efficient way to utilize unused space and maintenance areas. They are highly economical, lightweight modular and versatile. The structures are mostly made of steel that is joined with sturdy bolts and can be modified as and when the expansion is needed. For Business: For Business or Product inquiry fill our short feedback form. email at info@stagecurtains.in and we will get in touch shortly. Troll Free Number - 1800-200-6000. Make Your Stage More Lovely! Are you looking for new stage curtains but confused? Copyrights © 2016. All Rights Reserved By Stage Curtains.